So these thoughts prompted me to want to write about the dark side of my career. What few people in the wine industry talk about – except to other industry insiders. So here goes. I can’t bleach my teeth. 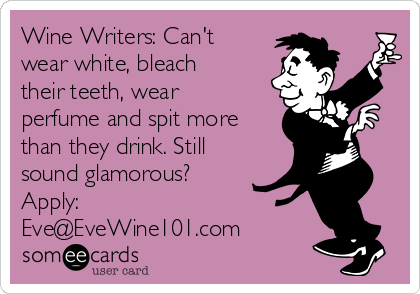 Because I taste and/or drink red wine several times a week I don’t have a clear window of enough time to bleach my teeth effectively. I can make an appointment and have it done for me, but it seems kind of defeatist. So your teeth will always be whiter than mine. I can’t wear perfume. Perfume would alter the perception of aroma (bouquet is the term if an older wine) in wine. When I am sitting at home tasting and writing, no other aromas can invade my space. If I’m at an event I resent both perfume and after shave. When judging if anyone is wearing perfume, scented body lotions, hair spray, etc. – they would be disgraced. Problem is I have some nice perfumes, purchased by my husband, but I rarely can find a time to wear any of them. Wearing white is problematic. 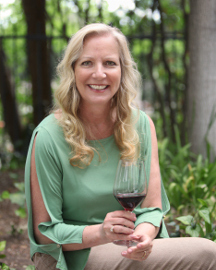 When I judge wine, whether in a competition, for a review or at an event, I will breath air in over my tongue – filled with less than an ounce of wine – in an effort to open the wine and get more from a taste. As you can imagine, spills can happen when I do this. It’s a treat to wear white but I have to think about where I’m going and what I’ll be doing first. I eat more red meat than I should. I have a preference for red wine when I dine out, and will often select my wine from the list before my food. So though I may enjoy a white or sparkling with a salad, or other light appetizer, I usually go for a Bordeaux or Rhone blend with dinner. I have to spit. I would much prefer to taste and then swallow wine, and I do that plenty, but I actually have to spit out wine more than I get to drink it. A few weeks ago I judged the Long Beach Grand Cru for two days and I really looked forward to attending the public event to get to have the pleasurable end, the drinking part. There are a lot of wine events to cover. I try and attend every local non-profit wine event so that I can advertise it with a column. There are a lot of events, near and far, that I get invited to. It’s very hard to get to them all, and visit so many worthy winemakers, but I do as much as I can. I usually enjoy them but ask any wine writer, it can get physically tiring to cover so much ground. Some of the I’m-new-to-wine questions can be solved by a Google search. I’m not Google. 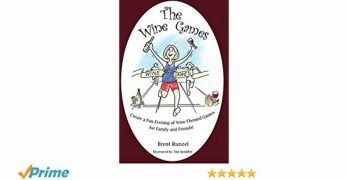 I love questions from beginners that lead to a discussion, and teach them a little about the big world of wine. 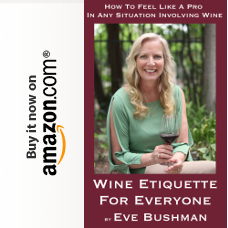 But don’t ask me for a dining review (see my Yelp), a hotel in wine country (see my Trip Advisor reviews) or which wineries I like (I have to Google myself and the region you want to give you an answer).